December is almost here, and you know what that means. Yup, it’s time for the big man in the red suit to try and squeeze his way down your chimney. 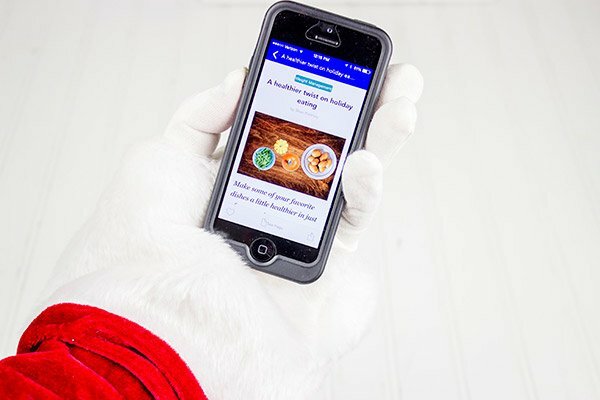 With any luck, Santa didn’t eat too many cookies before he got to your house. Otherwise he might get stuck in the chimney. I’ve seen that happen, and it wasn’t pretty. I mean, c’mon, the man gets a glass of milk and a plate of cookies at every stop he makes. I don’t have a PhD in Math, but even I know that’s a lot of cookies. Now that I think about it, maybe Santa would enjoy something a little healthier. Like a bowl of Creamy Carrot and Sweet Potato Soup. A bowl of hot soup will warm him up, and he might even be able to make it back up your chimney. After all, opening the front door for Santa might wake up the kids…and that’s just unacceptable! Several tins of cookies on the counter. Chocolates in a bowl on the table. Leftover turkey and mashed potatoes in the fridge. Does this sound familiar? (I didn’t even mention the cheesecake or the pumpkin pie.) There is no shortage of awesomely delicious food in our house during the holidays. But here’s the thing about that awesomely delicious food…it’s not all that healthy. That’s where soup comes in. We eat a lot of soup during the winter in the Spiced house. Not only is it a quick and easy lunch, but it helps us balance out the traditional not-so-good-for-you holiday food. 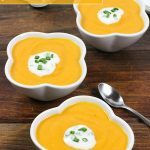 I came across this recipe for Creamy Carrot and Sweet Potato Soup when I was reading an article on the Sam’s Club Healthy Living Made Simple Magazine (app available for free on iTunes for iPhone and iPad). The article was about eating healthier during the holidays, and it pointed out that the average weight gain during the holidays is just 1 pound. 1 measly pound! But the problem is that pound is usually not lost over the year…so it just adds up over time. 5 years…5 pounds. 10 years…10 pounds. Not a good trend. 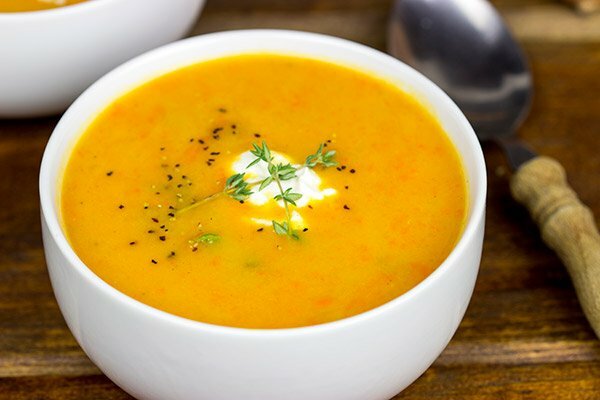 This article on Healthy Living Made Simple included several awesome sweet potato recipes…and the Creamy Carrot and Sweet Potato Soup recipe sounded like it was right up my alley. I decided to give it a shot, but I did add some cooked wild rice to the finished soup. Wild rice is loaded with fiber, so it makes you feel full longer. My wife and I actually had a similar soup at our wedding…and the wild rice mixed into the soup was a fun and tasty addition. 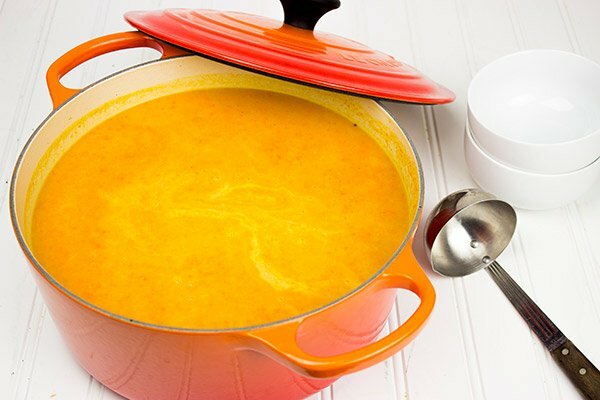 This Creamy Carrot and Sweet Potato Soup was quick and easy to make, and it made for some really tasty lunches, too. I grabbed a big bag of sweet potatoes at Sam’s Club for this soup, and there’s enough sweet potatoes left over to make another big batch of soup. I’ll do that on Christmas Eve so that Santa can have a fresh bowl of soup when he stops at our house! Ok, maybe I’ll let him have a cookie, too…but only if he runs a couple of laps around our house first. Looking for some fun and easy ways to lighten up your traditional holiday foods? For starters, ditch that turkey skin. It’s loaded with extra calories! 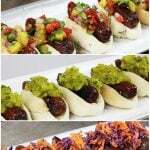 Check out the article on Healthy Living Made Simple for some more healthy eating recipes for your holidays. 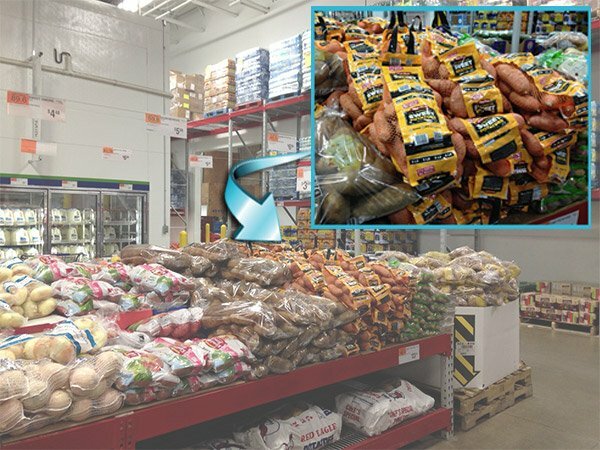 Connect with Sam’s Club for more holiday recipe ideas! Cook the wild rice according to the package instructions; set cooked rice aside. Meanwhile, melt 1 Tbsp of butter in a large Dutch oven or stock pot over medium heat. Add the diced onions and cook for 5-6 minutes, stirring occasionally, or until onions are slightly tender. Add the cinnamon and nutmeg; cook for 1 minute, stirring constantly. Move onion mixture to one side of the pan. Add remaining 2 Tbsp butter to open space. Increase heat to medium-high and cook for 1 minute, or until butter begins to brown. Add sweet potatoes, water, broth and carrots. Bring mixture to a boil; then reduce heat and simmer (covered) for 35 minutes, or until vegetables are tender. Stir in the cooked wild rice, half-and-half, salt and pepper; garnish with fresh thyme and sour cream (optional). It is indeed creamy and flavorful…and it’s healthy, too! We’ve been eating this soup for lunch, and it’s been a perfect way to balance all of the heavier holiday foods. I hope you enjoy it, June! 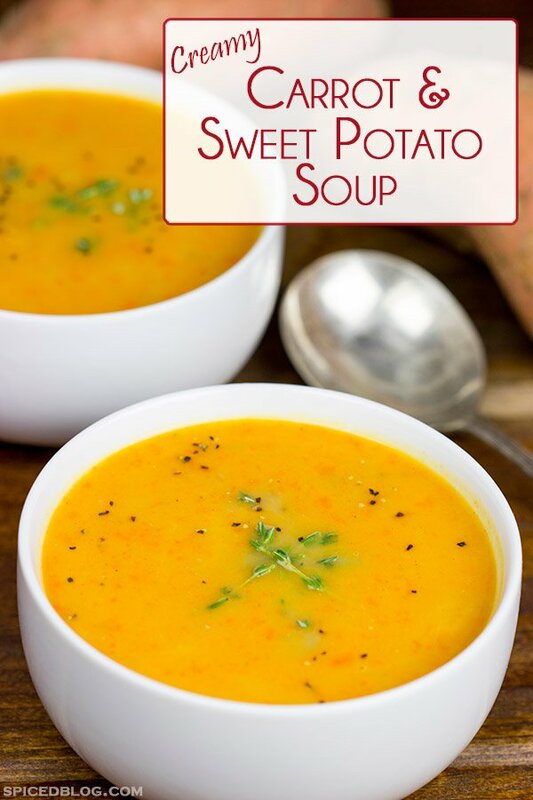 I’m a big fan of soups in general, but you’re right… gotta keep the pounds down, and I can’t think of a tastier way to do it than with your sweet potato soup! I love that healthy eating app, by the way. I need all of the healthy recipe inspiration I can get! 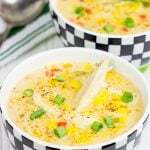 This soup looks so comforting & delicious! Love that it includes my favorite, sweet potatoes. I love wild rice in soups, it adds a bit of crunch and tons of taste. I’m loving the flavor combo you’ve got going on here David, Sweet potatoes + carrots + thyme = da bomb! Thanks, Mike! The wild rice in soup trick is easy…and it added a ton of flavor to this soup. I’m totally going to keep a stock of wild rice in the pantry just for soups this winter! Seriously – I gotta agree with Mike (I promise am not stalking out your comments) but wild rice and sweet potatoes and thyme are a wonderful combo – specially when cinnamon and nutmeg are involved! Hmmm when you put holiday weight gain that way….This soup looks delicious and healthy to boot! Would it be considered balance if I ate this soup and then munched my way through 10 cookies? No? Okay fine. Love the colors! I’ve never thought to combine carrots and sweet potatoes! Pinned! Thanks, Samantha! I just finished a bowl of this delicious soup for lunch. I hope you enjoy this one as much as we did! Hey Donna! That’s a good question. I’d estimate that the sweet potatoes would be about 1000 grams while the carrots would be about 275 grams. This is a rough estimate, of course…but it should get you going in the right direction. I hope you enjoy this soup as much as we did!! I am going to make this soup for a couple of my friends who are not feeling well. I’m also going to make it for a surprise dish for a Christmas party. Thanks for the comments too! Love this!! I love sweet potato soup!! Making this! !